Triple action gel for connective tissue, joint and muscle care. Optima Joint Complex Gel is a carefully designed formulation that may help to maintain healthy joints, bones, muscles, tendons and ligaments. Glucosamine is well documented for its positive effect on joint health and in this unique formulation is combined with Devils Claw, MSM, Menthol and Essential Oils. Initial application creates a pleasant cooling effect due to the menthol content, whilst the essential oils aid circulation to the skin resulting in a warming sensation. Optima Joint Complex Gel smells pleasantly fresh, is non-greasy and adsorbs immediately. Aqua, Dicaprylyl Ether, Polysorbate 20, Menthol, Pinus Sylvestris, Glycosaminoglycans, Propylene Glycol, Harpagophytum Procumbens, Dimethyl Sulfone, Aloe Barbadensis, Citrus Dulcis, Citrus Limonum, Eucalyptus Globulus, Rosmarinus Officinalis, Acrylates/C10-30 Alkyl Acrylate Crosspolymer, Disodium EDTA, Sodium Hydroxide, Phenoxyethanol, Methylparaben, Propylparaben, Citral, Limonen, Lanalool. Apply several times a day as required. Apply a thin layer of gel to the appropriate area and gently rub in until absorbed. For external use only. Not be used during pregnancy. Do not use on small children. Avoid contact with eyes. Do not use on broken skin. Order came the next day. Was packed well. 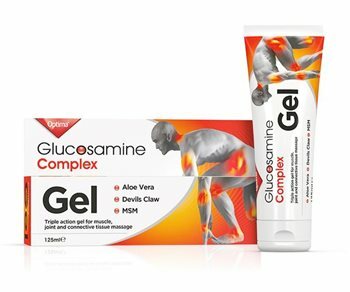 Optima Glucosamine Joint Complex Gel worked better than anything else I have used. I suffer from inflammation in the spine and this gel certainly takes down the inflammation, helps with any pain and speeds recovery. If you have problems with strained muscles or like me a reoccuring back problem, then this is a must, at the first twinge I use this and more often than not it saves me an expensive trip to the osteopath.